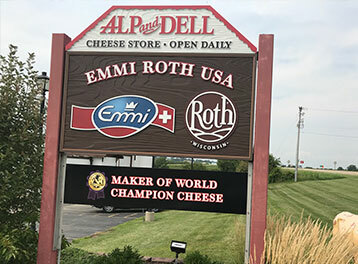 "Award Winning Monroe Wisconsin Cheese Store featuring Emmi Roth Kase Cheeses in Southern Wisconsin." Our Monroe cheese factory viewing hall is open to the public and allows you to observe the cheese making process. 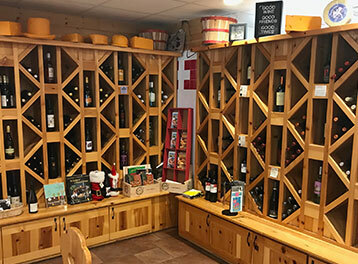 Tony Zgraggen, the proprietor of Alp and Dell, is generally available to host larger tour groups - it is recommended that larger groups call ahead to the Alp and Dell Retail Store to reserve a date and time: 608-328-3355. 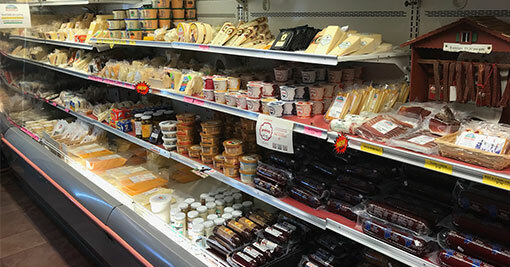 Stop and taste the difference tradition makes, or call today to order our award-winning domestic and imported cheeses. 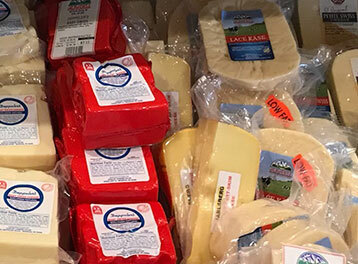 We have bulk cheese in wheels and loaves or smaller quantities. When you order, we can cut your cheese fresh and vacuum seal it, we can film wrap if you prefer. Cow print gift boxes are available all year. We generally do not ship in the months of June, July or August. Alp and Dell Cheese Store is connected to the chalet-style Emmi-Roth Kase cheese factory in Monroe, Wisconsin. Recognizing the opportunity to craft excellent specialty cheeses in America, Roth & Co. founded Roth Kase USA, Ltd in 1991, with a focus on crafting and curing European-style specialty cheeses here in America's Dairyland. 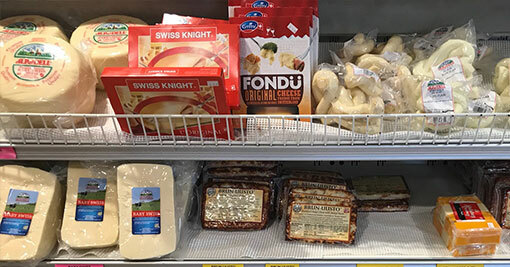 Emmi of Switzerland purchased Roth Kase in in 2009, and together, manufacture specialty cheeses in the Monroe factory, and in Switzerland.